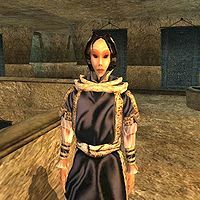 Eraldil is a Bosmer savant who can be found in the Waistworks of the Hlaalu canton in Vivec. She is the target of the amorous intentions of a certain Dunmer trader. Eraldil wears an extravagant shirt with a matching skirt and pair of shoes. Aside from her natural resistance to disease, and the ability to command animals, she knows no spells. This page was last modified on 9 October 2015, at 18:57.